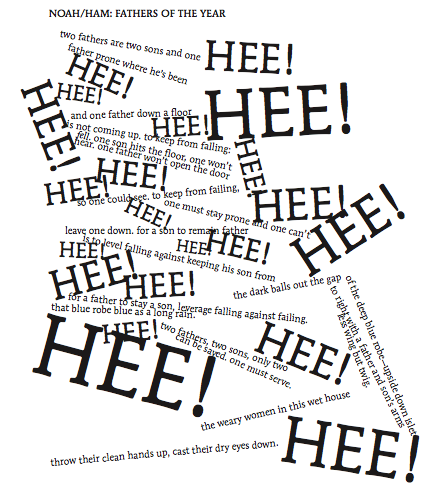 In Michael Ondaatje’s 1970 film The Sons of Captain Poetry, bpNichol, influential concrete and sound poet and the subject of the film, says, “The use of other media [is] an exploration of, ok if you’re gonna actually have a poetry which is visual, that is, is print and is put on a page, then why not actually utilize the page as the unit of composition and utilize visuality as its main feature?” I don’t know whether Douglas Kearney has seen this film and heard this quote, but he’s almost certainly familiar with Nichol’s work. 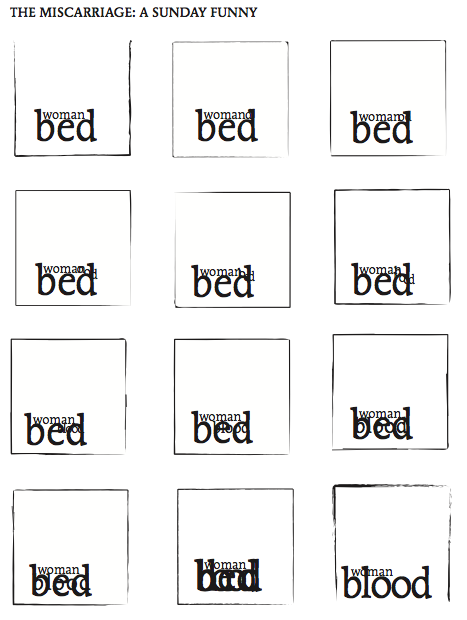 These visual elements create layers of meaning that are impossible with just text, and can, as in the poem above, even enact the event the poem seeks to describe. Notice how “blood” comes out of the “woman” who lies on the “bed” until the blood overwhelms both bed and woman. 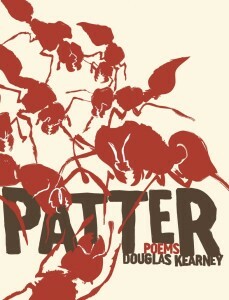 Thanks in part to the seven “Miscarriage” poems, Patter is, if not Kearny’s most personal book, definitely his most intimate. The content delves into the difficulties of conceiving children and the traumas of miscarriage—traumas that are felt psychologically by both members of a couple, but physically by only one. Kearney’s interest in masculinity and the role of men in relationships, especially of black men, are present here as they were in his earlier work, but the damage of miscarriage—a very real event in Kearney’s life—is the fulcrum around which the book turns. Layered and reused throughout the collection, this refrain is a raw distillation of feeling that is surprising no matter how many times it appears. These poems are an intimate look into Kearney’s marriage and hint at the complex and heart-wrenching pain a miscarriage inflicts on a couple. The intimacy could turn some readers off, but ultimately it speaks to Kearney’s ability to tackle difficult subjects with his eyes wide open. Kearney (and his wife) lets us into his marriage, into his marriage bed, to explore what it means to be a father, when, and how one becomes a father. It’s rare to find a poet who so bluntly and openly explores issues as personal as the ones in Patter. Euphemism and abstraction are generally the theme. What Kearney has done with this collection is assert himself not only as an innovator of visual poetry, but also as an important and far-reaching voice, unafraid to stare directly into tough topics and not blink. One of the sharpest tools in Kearney’s toolbox is the page itself.